The spirits of the dead (and living) play an important role in the technology of Mars, which is aptly named “haunt-tech.” This is sufficiently advanced technology in a literal sense; the guardian wards and spirit-walking staples of fantasy could be substituted for their haunt-tech equivalents without any significant alteration to the plot. I am in favour of a disrespectful attitude towards genre boundaries, but it requires a skilful act of blending to translate this into a convincing narrative. At times it feels as though Williams is writing heroic fantasy with the trappings of sf. I’m going to have to think some about why Hastur prompted this response from me, but Winterstrike didn’t; at the moment I think it’s partly because Mars is imaginatively closer to where we are now than Darkover is (and because that closeness is underlined more than once), and partly because Winterstrike seems much more to encourage you to notice the similarities between the sf and fantasy traditions it’s drawing on. 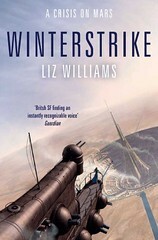 Haven’t read Winterstrike but I did read Banner of Souls, and it definitely struck me as fantastical rather than SFnal — if in a post-Miévillian or, more likely, post-Final Fantasy sort of way. Whereas Bradley is more post-Ballantine Adult Fantasy, and maybe that makes it more obvious. I have a feeling Williams would say post-White Crow-period Mary Gentle, rather than post Mieville, but that doesn’t surprise me — I get the impression Winterstrike is set quite a bit later, and that in the interim the society is meant to have rediscovered a certain amount of history and technical knowledge that had previously been mysterious and magical. While it’s a mild spoiler to say so, [mystery book!] is a more recent example of Mars SF than The Empress of Mars. If you want “planetary romance”-ish stuff in a Mars-ish setting — Burroughs-style Mars, that is — there are R. Garcia y Robertson’s recent stories set on a planet called Barsoom, with thoats and Red Martians and all … “Wife-Stealing Time” and “Sin Bad the Sand Sailor” … nice light fun. Other recent Mars stories include (sort of) Robert Charles Wilson’s SPIN, and John Varley’s trilogy (RED THUNDER, RED LIGHTNING, ROLLING THUNDER). Your point stands of course — there was a decade or so there where Mars novels and stories were all over the place, and they seem by comparison rather thinner on the ground now. I will say that I unreservedly love McDonald’s Mars, particularly ARES EXPRESS. Why spoil an unrelated and recently published book just for the sake of “one upping” the reviewer on the oh-so-crucial issue of which is the most recent book on Mars? I have not read [mystery book! ], but I have read some of the publicity and the setting has not been made clear, and in fact appeared to be a source of mystery – now, no longer. Thanks. Even more of a pity that this happens reading comments to a review of perhaps one of the dullest works of SF I have ever had the misfortune to read. The endless capture, escape, repeat sequencing is akin to a bad Doctor Who episode without the camp charm. I’m going to go and edit the above comments to remove the title in question, I think. The Muse of Thoroughness calls on you to neuter AV’s comment too.